Not everyone who promotes bicycling has the same goals in mind. Some people see bicycling as a healthy activity for bodies, and promote it this way. Some people see bicycling as good for the planet, and promote it this way. More and more people see bicycling as good for real estate values, and they promote it this way. I see bicycling as a community-building phenomenon. On a bike, you're in much closer contact with a neighborhood than when you are in a car, or even a bus. You are the Jane Jacobsian eyes on the street. You tend to share your knowledge about routes, clothing and other gear, media, and other bikey stuff with your bikey friends. Our social networks enable us to do something that many people consider beyond Thunderdome. And yet, the very social life that enables bicycling has made it seem exclusive; it takes place in subcultural worlds. As subcultures, we can be milked as markets who will reliably buy things labeled according to our apparent specifications. For urban dwellers like myself, this means we're contributing to displacement through gentrification because we are seen as members of the "creative class," desirable inhabitants that city governments and business interests agree will produce economic growth and higher property values. The "green" neighborhoods they're building in our names often bulldoze existing enclaves, either literally or with rising rents and colonized public spaces. 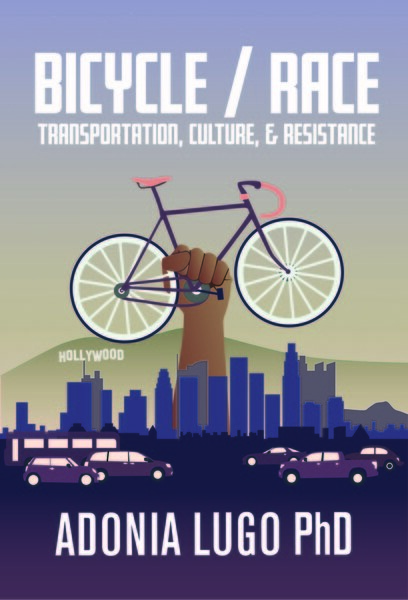 Bicycling in and of itself does not exclude people of color or low income people. However, the harsh reality of race and class in this country is that a lot of us grew up in segregated neighborhoods and towns. The "Mexican schools" of the early twentieth century had long been illegal by the time I was in school, but that's what a white 12 year old called my elementary school when I entered junior high in 1995. Where we come from doesn't determine who we make friends with as adults, but it does shape our expectations and cultural frames of reference. Making friends of completely different backgrounds from our own can be awkward; I know, cause I'm a Chicana who went to a liberal arts college on scholarship. (Over time, it started to seem normal that the kids smoking a bong in front of me went to exclusive boarding schools.) Getting to know people different from ourselves takes effort. We end up reproducing the segregated spaces we grew up in not because of an active desire to do so, but because we spend time with people that reflect our worldviews. Are we going to let redevelopment *accidentally* clear our cities of the people we don't know how to spend time with? Many people I know bristle at the use of the term "accident" to describe what happens when cars collide with people, places, and things. Accident implies that nobody is to blame, while "crash" expresses that the driver did something destructive. The displacement and dispossession that are happening under the guise of urban sustainability are very clearly a crash, not an accident. Usually people talk about bike promotion through infrastructure, like bike lanes and off street paths, the very things that are now being associated with gentrification. But aren't we out there riding on the roads as they exist today? Aren't we the ones our friends ask for help when they've had a bike stolen or want to start using panniers? Aren't we the ones who explain, more or less patiently, that yes, we do have the legal right to ride in the street, and no, we aren't going to get the f**k out of the way? Aren't we the ones who know that biking is possible even in cities where cars are thought to reign supreme? We are human infrastructure for bicycling, my two-wheeled friends. Can we imagine ways to make bicycling more possible for more people that draw on our existing skills and social lives? I found a beautiful quote yesterday by the urban theorist Margaret Crawford, writing in 1992 about LA's ecology of fantasy. Commenting on the proliferation of hyperreal theme environments, she wrote that, "one can still imagine, however, a future in which environments that do not orchestrate escape from daily life might include an awareness of multiple realities. We cannot expect the individual automobile to disappear or for Los Angeles' dispersed fragments to come together, but we can still hope that the theme circuits we endlessly create might become inclusive rather than exclusive, expansive rather than reductive, and that the principle of mobility might be used to cross boundaries rather than to construct them." This is precisely the value I see in bicycling: it is a mobility that can cross boundaries. Let's be the human infrastructure and grow bicycling through creative community building. That's what I had in mind for CicLAvia, and recently the New York Times credited the event with improving bicycling conditions in LA. Human infrastructure works.